Belton Farm Coloured Cheshire – Supreme Champion at the Nantwich International Cheese and Dairy Awards 2018. One of the oldest recorded cheese, best when aged between 2-3 months, giving a classic taste with a acidic yet citrus flavour. Belton Farm Double Gloucester – A cheese that has won many awards in the past and present. A mellow, buttery flavoured cheese with a straw like colour, best when aged between 10 – 12 months. Somerset Brie (Speciality Cheese co.) – Somerset Brie portray a superior creamy taste and richer consistency. The cheese aroma suggests mushrooms with a hint of green grass. It is a mild, fresh cheese with an edible rind. 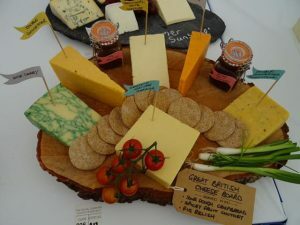 Cornish Blue Cheese (Cornish Cheese Co.) – A full flavoured sweet creamy cheese with distinctive character and has been internationally recognised by the many awards it has won. Belton Farm Red Fox – A two year old, complex modern British cheese with a brittle yet creamy and caramel flavour, with a unexpected crunch, leaving a final savoury taste. Belton Farm Sage Derby – A vat made cheese infused with sage, leaving a green marbling effect. Aged for 6 months, this cheese offers a theatre stand out. How much cheese is recommended? We would recommend 50g-100g of cheese per person, as a reasonable amount for an after-dinner cheeseboard or 150g per person if the cheeseboard is being served as a meal or a snack. The traditional cracker and biscuit or even an artisan bread can complement the cheese perfectly, alongside a choice of chutneys, fruit confits and selected dried fruits such as Hawkshead Relish Company’s Spiced Apricot & Cranberry Chutney. We would also highly recommend Peters Yard, who offer a wide range of high-quality crackers and biscuits, that also accompany the cheese perfectly. However, remember not to overload the cheeseboard with too many additions – A selected chutney, crackers/biscuits and some bread is enough to complement the cheese on the board. We recommend the cheese to be stored in a cold room or in the bottom of a fridge, wrapped in its original packaging or in paper, allowing the cheese to breath. When presenting the cheese board, the cheese should be around room temperature, and taken from the fridge or cold storage room approximately 20 minutes before serving, to improve flavours.